Get your Missouri insurance license using an America’s Professor online training course. Our comprehensive video lectures, review questions and study guide will help you learn, and retain, the material needed to pass your Missouri insurance license exam the first time! Passed on the first attempt. The material prepared me for the exam and Jack's delivery kept it from being boring. I would highly recommend this course. This course was REALLY helpful and I felt 100% prepared for the Property and Casualty exam. The real life examples that Jack had were key to remembering the information. Thank you America's Professor! I passed both my Missouri Property & Casualty, and Life & Health exams thanks to America's Professor. I bought the books first, and quickly found out reading those wasn't going to work for me. Being out of school for 25+ years, I needed something to work at my own pace, and with the help of Jack's humor kept my attention. I called numerous times for course extensions, and every time the person who took my call was helpful and encouraging! The next time I need some sort of training, Americas Professor will be my first choice. I couldn't have done it without your course, thank you! Thank you American professor, this course was an excellent study guide. I took two different courses in the last 4 weeks, accident and health as well as property and casualty passing both tests on the first try. Jack made it interesting and his examples gave me a leg up on the test content. If I had to make any suggestions on improvements to the course it would be to have the review test and final exam question be different each time they are retaken. I would still give the course 5 stars though, I couldn't have passed without taking this course. AP RESPONSE: Congrats on passing your exams Jerry! Also, thank you for your recommendation. This doesn't apply to you but a note to future students, we find that review questions are a slippery slope... We try to provide enough questions as to test your knowledge on what we TAUGHT in the lectures. We want to make sure that students just don't take the review questions over and over as a way to learn the content. This is not a good study practice as it leads to memorization of our test questions which are different than what's on the actual exam. Please see here on how to be a GREAT AP Student! This course took rather dry material and made it much more interesting. Very helpful and was able to pass the exam first try. Would recommend to anyone. I am really happy I chose them to study with for my P & C test. They are very helpful and teach you all you need to know to pass the test. If I decide to take more, I will be going through them because they truly want to help you, and help you pass. Great customer service and very friendly people. I like the focus on the topics, the video/audio combination, and the availability, I could choose the time to engage, begin where I left off, review my past test scores. Review and retake the test is a plus. Please also check our frequently asked questions about the Missouri Insurance Licensing Exam. America’s Professor has insurance licensing exam prep down to a science. Our comprehensive course material covers everything you need to know to pass your exam. And, the practice test questions on our quizzes are formatted similarly to the questions you’ll see on the exam, so you know what to expect on test day. There’s a reason America’s Professor gets rave reviews from our students—we go above and beyond to make sure you’re armed with the knowledge you need to pass your exam. Prepare: The best way to prepare once you’ve decided which license you plan on obtaining is to enroll in a pre-licensing course through America’s Professor. Our comprehensive courses include 24/7 access to our online videos for 45 days (with additional time at no charge, if needed), a hard copy textbook designed to complement the online videos, plenty of sample questions and practice exams, and exceptional customer support. Pass: Each state, including Missouri, has its own licensing requires. 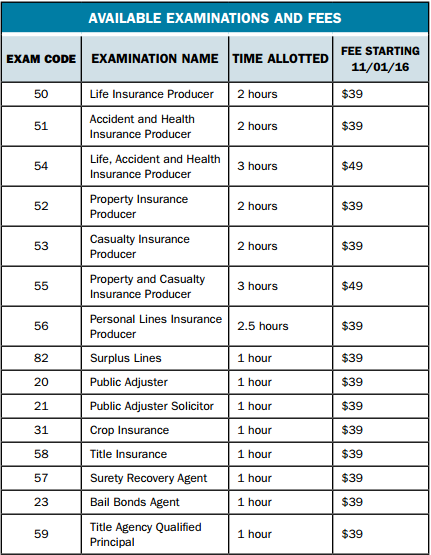 Whether you’re studying for your life insurance license exam to become a life insurance sales agent, or you plan on becoming a customer service rep for an insurance company, all 50 states require you to be licensed in order to sell insurance or discuss insurance transactions. Our comprehensive pre-licensing courses can help you prepare for and pass your exam on the first try. Missouri offers several different exams, including a property exam; a casualty exam; a life, accident, & health exam; an exam for surplus lines; public adjuster; and others. All exams require a score of 70 to pass, and each one consists of two parts: a national insurance section, and a state-specific section. You will need a score of 70 on both parts—the two scores are not averaged. For more information about the requirements for each exam, the number of questions on the different exams, test center locations, and other information, click here. Test Registration: Pearson VUE is the testing company that administers the exams in Missouri; you must call them at 1-866-274-4740 to register. It’s best to call at least 3 days in advance of the date you wish to take the exam in order to ensure you get the date and time of your choice. Testing Centers: There are several testing locations throughout the state of Missouri. There are also dozens of testing centers in neighboring states for those who live near a state border. See the “How do I sign up to take the Missouri insurance exam and where is it given?” section on this page, or use the Pearson VUE website to find a test center near you. Licensing Application Fees: The Missouri Dept. of Insurance charges a $100 license fee for most license types. Licenses must be renewed annually; the renewal fees range from $50-$150. The comprehensive courses America’s Professor offers have helped thousands of students pass their exams—the first step toward launching a career in the growing field of insurance. Enroll in a course today!